Along with Fluff and Fripperies, Revlon is also celebrating a birthday this year. The brand is 80 years old, having been the first to create opaque nail enamel way back in 1932. Can you believe it?! In celebration of this, Revlon have re-launched their nail enamel collection with new additions from the pretty lilac tones of Charming and the daring Red Bikini, to complement classics like Revlon Red. Other key launches this season include Revlon PhotoReady™ Airbrush Mousse Make up, an air-infused mousse make up that is light as air on skin and contains photo-chromatic pigments, which bend, reflect and diffuse light for perfectly airbrushed skin in any light. Use with Revlon PhotoReady™ Perfecting Primer a revolutionary primer that helps soften skin and diffuse light to help minimize imperfections. One of the most anticipated products for Autumn/Winter is the new Revlon ColourStay 16 Hour Quads. Available in 7 different palettes, there’s a ColorStay™ 16 Hour Eyeshadow Quad to suit every occasion – day or night. Each palette contains four expressive, silky, blendable shades that won’t crease, fade or smudge. 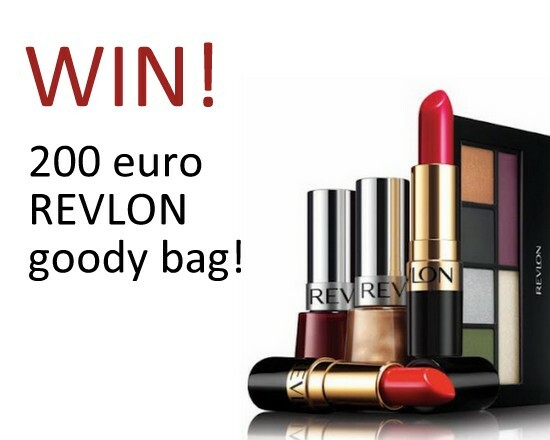 To celebrate Revlon’s 80th birthday, Fluff and Fripperies has a goody bag of Revlon products worth over €200 to giveaway to one lucky reader, resident in the Republic of Ireland. Just follow the steps below - and good luck! This is awesome. I'd like to win please! Thank you for all your fantastic give aways. You have us spoiled rotten at this stage! again! wow we are being spoilt!! My jaw just hit the keyboard... amazing prize! I didn't know it was Revlon's birthday! That's amazing, 80 years! You probably already know that Revlon is my favourite "drugstore" brand. Their lipsticks are my favourite, I love the new Cherry Blossom from the Shanghai Collection. It's such a beautiful colour. hope you've had a good week Emma! GREAT PRIZE!! Been a revlon fan for years. Thanks for all the giveaways! Another great giveaway, count me in please.. This is ridiculous! Another great prize! AH! I love Revlon! This would be amazing! I love all your giveaways, I've never owned Revlon products, but would love to win this. Wow, I adore Revlon, this would be a dream come true! Wow great prize, would love to win this!! so many giveaways! my goodness, the free stuff must be taking over Fluffy Towers! I'd so love to win! Thanks for all the competitions! Revlon was founded in 1932 by brothers Charles and Joseph Revson, and chemist Charles Lachman. Revlon's nail enamels contain no formaldehyde, DBP, or toluene. Yet another awesome giveaway! Would love to win this and update my make-up for the party season! Lost my make up bag last week so winning this amazing prize would be fantastic!!! Love Revlon! Another fab prize! I love Revlon so much! Oh my wow! Fabulous prize! Fantastic giveaway how fab for one lucky person!! just in time for party season! Would love to winany of the great prizes...they are all amazing! what a great giveaway!! How generous of you, thank you. I want to be entered please! One of my fav beauty brands!! Too many fab prizes...I want them all! But I'd also be happy with one!